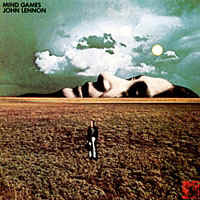 "Mind Games" was John Lennon's fourth major release and the first album which he produced on his own. The previous three all employed Phil 'wall of sound' Spector as co-producer, along with John and Yoko. It was released Nov. 2, 1973 (US) and Nov. 16, 1973 (UK). So come on, get it on! Bake the cake and eat it too! We don't want no pig brother scene! Fingerlickin chickinpickin Meat City shookdown U.S.A.
Chickinsuckin mothertruckin Meat City shookdown U.S.A.